A celebration in the Center for Achievement in Psychological Science, which opened last fall to support students in CSUN’s Department of Psychology. Photo courtesy of Elise Fenn. How do we close the graduation gap? How do we ensure students have the resources they need to succeed academically? Those are questions people in higher education — including at California State University, Northridge — have been grappling with for decades. In a search for answers, faculty and staff in CSUN’s Department of Psychology asked their graduating students strategic questions about what they thought the department should do. The data department officials received inspired them to find ways to foster a more familial environment that provides academic and peer support as soon as new students step through the department’s doors, whether as freshmen, sophomores or transfer students. Psychology department chair Jill Razani agreed, adding that the department was dedicated to helping its students succeed. The department’s effort, part of a university-wide initiative, began before the California State University Chancellor’s Office announced earlier this year its Graduation Initiative 2025 — a plan to increase graduation rates for all CSU students while eliminating gaps in graduation rates between better-served and underserved students, and between lower-income and higher-income students. A key component of the CSUN effort is the use of data to help meet an individual department’s or college’s needs. University officials contend the raw data can provide insight into which students may be having trouble accessing resources and help faculty identify which students they are not reaching. Recognizing that each student is unique, as are the dynamics within a department and college, university officials encourage faculty and staff to create solutions that fit their specific needs. The psychology department’s effort to examine the needs of its students began in 2015 with an exit survey of more than 300 graduating students. “The information provided by the students — such as the need for increased offerings of certain courses and the wider dissemination of student resources — was quite helpful,” Razani said. “Action plans by the department were designed around this feedback. “The department has been administering the exit survey annually, and plans to continue going forward,” she added. Additionally, Fenn was tapped by the College of Social and Behavioral Sciences to serve as a “data champion” for the university-wide initiative. As part of that effort, department-level faculty members collect and review raw data that can provide insight into which students need more help. While the Department of Psychology effort started independently of the university-wide initiative, Fenn said her tenure as a data champion offered additional information about opportunity gaps — the average GPA and retention rate — at both the university and college level. “That was one of the things that motivated me to pursue what we were doing at the department level,” she said. Armed with information, Fenn said, the department set out to foster a greater sense of belonging and support among its students to help close that gap. She noted that navigating a college environment is easier for those students for whom going to college is part of their family culture, and who have family members to turn to when they need help. The same is not true for first-generation college students. “Feeling that you belong and having the knowledge, or a map, for what you need to do when you are in college are critical for a student’s success,” Fenn said. The department received campus support to open the Center for Achievement in Psychological Science this past fall. It is a place where students can gather, meet with peer mentors, attend workshops or just hang out. “It’s a physical place where students can go between classes or ask questions if they need help — all in hopes of fostering a sense of belonging, a place that, as psychology students, is theirs,” Fenn said. 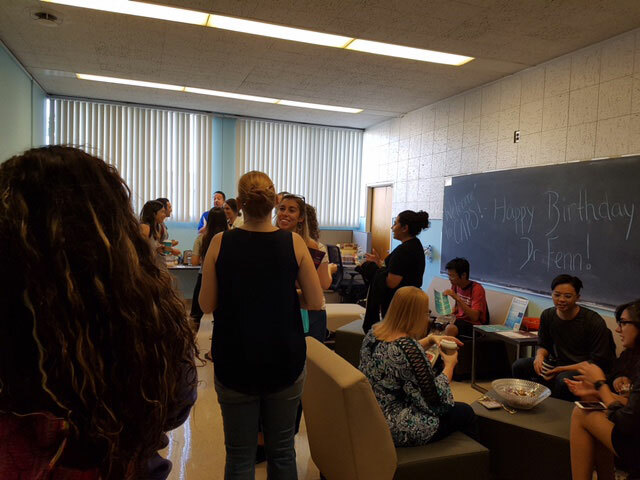 The center hosts coffee hours for faculty and students, and occasional discussions on topical subjects in the field of psychology and tips for surviving college. The department also created a peer-mentoring program in which junior and senior psychology majors can get class credit for serving as mentors to freshmen and sophomores. The program gives the upperclassmen an opportunity to apply some of what they have learned in the classroom, while at the same time providing them a chance to help someone successfully navigate the path to graduation. Fenn said department officials recognize that they may not be able to provide solutions to all the issues students have, so they are actively working to maintain relationships with organizations across the CSUN campus. “We are looking to take an inclusive approach,” Fenn said. “Our goal is not to reinvent the wheel. Instead, we want to be a central hub for students to find the resources that already exist on campus and direct them to those resources. As the department’s efforts move forward, Fenn said, psychology faculty and staff will continue to ask questions and gather data about student needs, and what is working and what is not working in the department.